René Peña is a self-taught photographer who graduated with a degree in English Language and Literature from the Higher Pedagogical Institute at Havana University. He is a member of the National Union of Cuban Writers and Artists (UNEAC) and of the Advisory Council of the Cuban Photographic Library. He has had numerous notable solo exhibitions, including Sad Blue Child (Villa Manuela Gallery, Havana, Cuba, 2010); Black Album, at the Bogota International Photography Festival Fotologia 6 (Santa Fe Gallery, Bogota, Colombia, 2008); Negative Relationships, with Marta María Pérez (Habana Gallery, Havana, 2007) and Territories and Cartographies in Black and White (International Contemporary Engraving and Art Book Fair, Madrid, Spain). He has also exhibited at the 1st Latin American Photography Forum in Sao Paulo, Brazil, 2007; the 4th “Xavier Miserachs” Photography Biennial Exhibition in Palafrugell, Spain, 2006; the National Hispanic Cultural Center of New Mexico in Albuquerque, New Mexico; the National Museum of Visual Arts in Montevideo, Uruguay; the Museum of Fine Arts in Montreal, Canada; the Triennale Bovisa in Milan, Italy; the Grand Palais in Paris, France; the Casa Freta Gallery in New York, and the Mattress Factory in Pittsburgh, Pennsylvania. His works are part of the collections of the National Museum of Fine Arts in Cuba, the Houston Museum of Fine Arts in Texas, the Latin American Art Museum in Buenos Aires, Argentina, and the Photographic Archive in Tuscany, Italy, among other important institutions. Black Marat, 2009. Digital Inkjet print. 44 5/8 x 59 3/8 in. Samurai, 2009. Digital Inkjet print. 59 1/4 x 30 7/8 in. Sin titulo (Untitled), 2013. Digital inkjet print. 41 7/8 x 31 1/2 in. 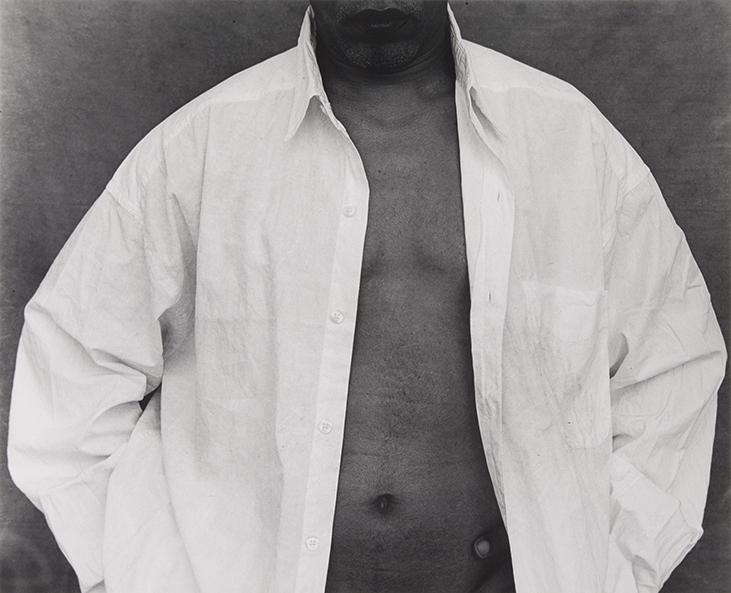 Untitled (Shirt), from the series White Things, 2000. Silver gelatin print. 18 1/2 x 23 in.